Rt. Hon. Michael Fallon MP the Minister of State for Business and Enterprise, said “Business Continuity for Dummies brings together the wealth of experience within Government in support of business continuity planning in SMEs. Working with business, this book takes an innovative approach to reaching out to the 5 million SMEs in this country to build the resilience of our communities and our economy. Written primarily with SMEs in mind, the guide acknowledges that smaller businesses just do not have the money, time and resources to prepare for disruptions, yet the cost of dealing with them when they do arise can be significant. SMEs often suffer disproportionately from disruptions of all kinds, including bigger emergencies, because many haven’t realised the impact to their business and their wider markets from disruption. Understanding the importance of continuity and getting it right, early, can see competitive advantages and in some areas, lower premiums to pay. Continuity Forum Chairman, Russell Price, added "The SME sector has really needed a Business Continuity Guide for Dummies for a long time. We are delighted that so of the most experienced people across the profession have come together to produce such a valuable resource that makes the adoption of BCM very much easier for smaller organisations. In addition, the guide has been written in a way to really help people more generally understand the benefits and steps needed to embed and extend BCM knowledge across organisations of all sizes and types." 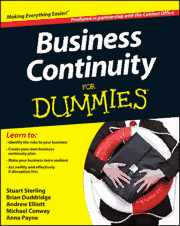 You can buy Business Continuity for Dummies by clicking the link below. 1. The Civil Contingencies Secretariat sits within the Cabinet Office at the heart of central government. It works in partnership with Government departments, the devolved administrations and key stakeholders to enhance the UK's ability to prepare for, respond to and recover from emergencies. 3. Business continuity management (BCM) is a process that helps manage risks to the smooth running of an organisation or delivery of a service, ensuring continuity of critical functions in the event of a disruption, and effective recovery afterwards. The Government aims to ensure all organisations have a clear understanding of Business Continuity Management (BCM). For more guidance: http://www.cabinetoffice.gov.uk/content/business-continuity.